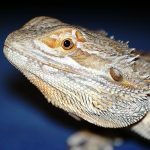 This post is sponsored by petMD® Reptile Center, and the BlogPaws Professional Pet Blogger Network. 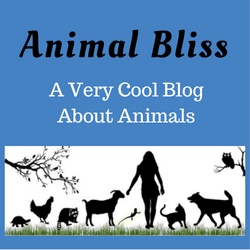 I am being compensated for helping spread the word about Reptile Ownership, but ANIMAL BLISS only shares information we feel is relevant to our readers. petMD® and PetSmart® are not responsible for the content of this article. 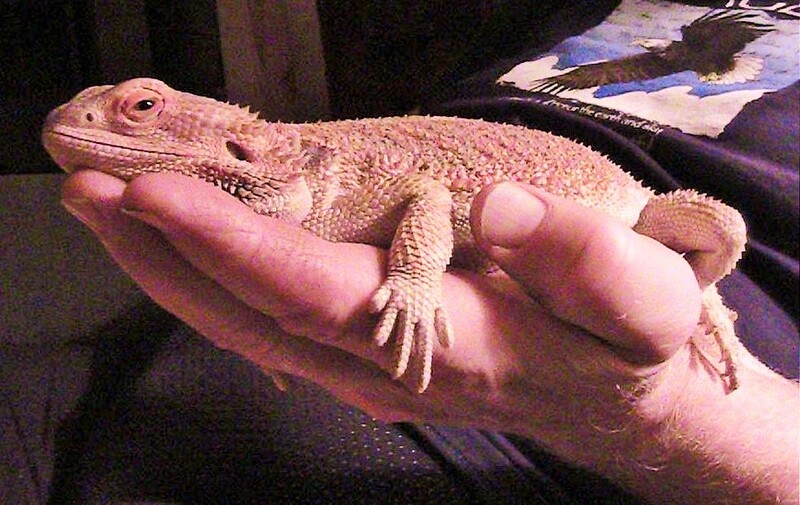 Raising a Bearded Dragon, or any reptile, is a bit of a novelty in my family and circle of friends. My fascination with them grew from meeting an iguana when I was in high school (a-hem ….a few years ago). I loved it and always said I’d love to get an iguana some day. 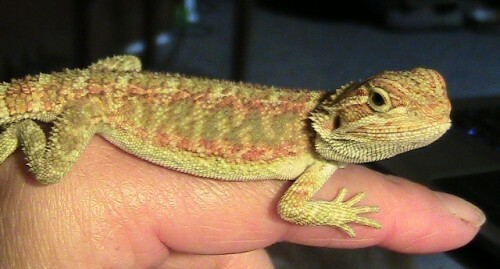 Then a year and a half ago, on my birthday, I decided it was time to make good on my vow to get a reptile. After doing my research, though, I realized that a Bearded Dragon would be a better choice for me, as a newbie reptile owner, than an iguana, and that’s when I got Shirley, my Bearded Dragon. I first saw Shirley at the local PetSmart. She sure was a cute little thing, only 4 1/2 inches long, and about 6 weeks old. I just had to scoop her up and take her home. Having done my homework beforehand, I knew what supplies I needed to get and I had it all set up for her at home. First-time reptiles owners are advised to let their new reptile pets adjust to their surroundings in their tank for a few days, weeks, or even months, before they try to handle her. That advice doesn’t work for me. I’m a hands-on kind of gal. I see an animal … I have to touch it. That goes for brown bears and lions too. Anyway, I held Shirley all the way home from the store, and still do every chance I get, so Shirley got used to being handled right away. She had no choice, really. 😉 Not in my house! Other than the basics of what she needed for her care, such as proper housing, heating, lights, and food, I truly didn’t know what to expect of her on a day to day basis. Knowing that a Dragon can live up to 10-12 years, I was looking forward to a lasting relationship. Who knew that a Bearded Dragon would have such personality? Right from the start, she fit right into our household. 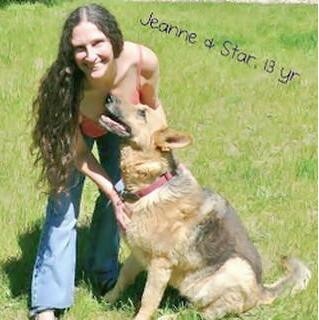 My cat and dog, Jessie and Jake, accepted her right away, so there was no problem there, although I watched very closely and was ready to run interference should either Jessie or Jake decide to take on a role of predator. Luckily I didn’t have to worry about that, but keep it in mind if you have other animals at home are thinking of getting a reptile of any kind. 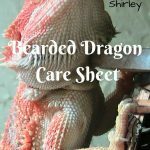 A Bearded Dragon is relatively easy to take care of, but they do need specialized care and attention, so I wouldn’t recommend getting one for a small child unless an adult is willing to take on the responsibility of raising a bearded dragon. Although they are hardy creatures, they’re also quite delicate and not meant for rough handling. When I get up in the morning I turn Shirley’s basking lamps on so she can warm up. She needs the proper temperatures and humidity in order to help digest her food and keep her healthy. She loves the heat, generally about 110°F, and can stay there for hours. She has a UVB light too, which is necessary to keep her bones strong and healthy. However, she does love to get out of her tank and run around the house too. She’s very active. She’ll pace back and forth, back and forth, all the while staring at me, until I go let her out. Shirley knows exactly what she needs, and that’s heat, so she heads for the sunny spot at the patio doors and lays there in the sun for as long as I let her, usually alongside Jessie Cat. When I think Shirley is cooling off too much, I’ll put her back under her heat lamps in the tank. 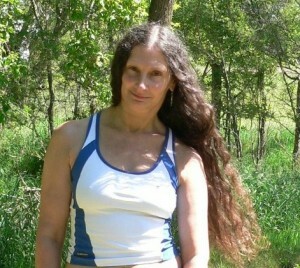 Shirley also loves the great outdoors and the sunshine is essential to maintain her bones. I try to take her out most warm sunny days, keeping a close eye on her because she’s a fast runner and we have a lot woods and cornfields where it would only take a minute to lose her. If you plan to get a Dragon and bring her outdoors, you can get a harness for her that fits snugly but isn’t to constricting, that will keep them nice and safe. Oh, and watch out for birds of prey! Some Bearded Dragons like to snuggle, and others don’t. Shirley likes to snuggle and sleep on my shoulder in the evening, at the end of her day. She’ll stay there until I ‘put her to bed’ when I’m ready to call it a day. I love that she likes to sleep there on me. Zzzz. Goodnight. Can your reptile bond with you? That’s debatable. Bearded Dragons are not like a cat or dog. They’re not known to be “lap animals.” They won’t come running to greet you at the door, nor will they come to you when you call them, although I’m sure there are exceptions. But after having Shirley around now for 15 months, I can say with surety that she’s become more of a pet than I thought she was going to be when I first got her. She approaches me more often than she used to when she’s out and about, and seems to like to hang out with me more. She seems more comfortable in her own skin. 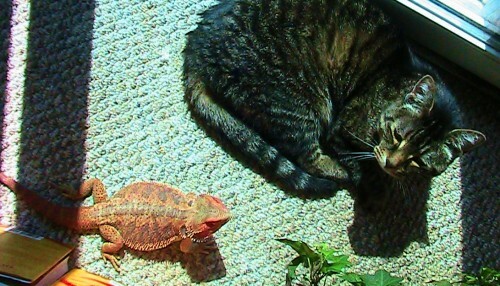 She’s grown to be a beautiful 18 inch long lizard (and still growing) with unusual pink-orange coloring. Raising a Bearded Dragon has been truly fun experience for me and I’m so glad I have her. Why? She runs like a little alligator with her rear legs bowed. She’s smart as can be, and independent too. She sets her own routine but is flexible with mine. She’s a conversation piece. I take her to a lot of places … the grocery stores, the bank, the video store, PetSmart … People love her. 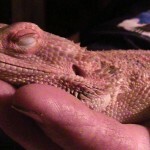 If you’re thinking of getting a reptile pet for the first time, do your research first. Whether you’re thinking of getting a snake, turtle, tortoise, or any other kind of lizard, it’s serious business and shouldn’t be taken on a whim. 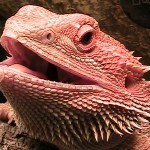 You can find a lot of good information at petMD’s Reptile Care Center. You can also connect with petMD on Facebook or Twitter. 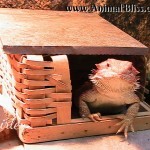 Do you have a pet reptile or are you thinking of getting one? Tell me about it in the comment below. 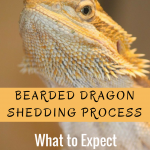 Yes, having the proper information about bearded dragon is a MUST. They have very strict requirements. We have a beardie, Dante, that we bought about 2 1/2 years ago when she was about 6 weeks old too, for my sons birthday (was supposed to be his but guess who gets to do all the work?). However, we thought she was a he, hence the name Dante. In June, she laid a clutch of eggs, even tho she had never mated. found out that if they sense or see a male around, they can lay eggs. However, now she is impacted and we are having to give her mineral oil to get things moving, and a bath twice a day. We were told to get a beardie because they aren’t as temperamental as a gecko, which is what my son wanted and still wants. Anyway, just found your site thru Amy and Aron’s giveaway blog. I enjoyed seeing your beautiful beardie. Oh, and Dante is orange also. Hey, Rhonda! Thanks for visiting my blog today. I’m glad you found me and hope you’ll be back. Thanks for telling me the story of Dante. It sounds like she’s been keeping you busy. I hope she gets through the impaction soon. That can be fatal, so my fingers are crossed. 🙂 Keep me posted!